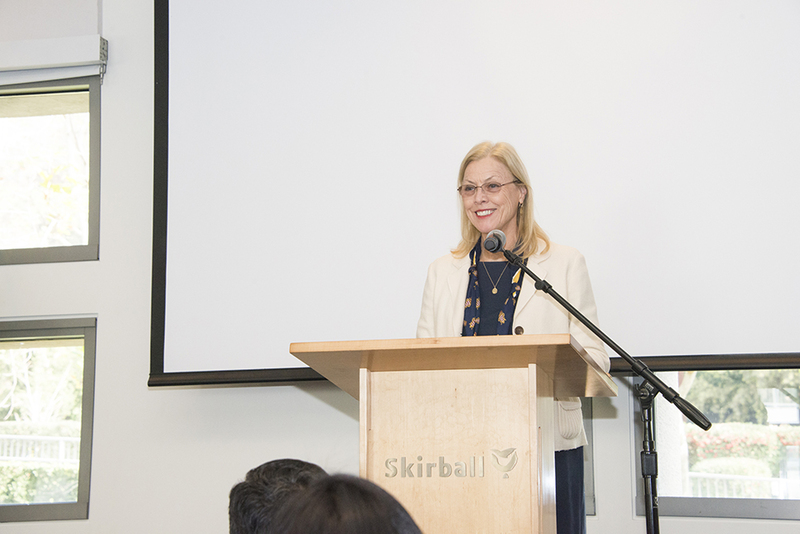 California State University, Northridge President Dianne F. Harrison spoke of the importance of professional relationships and a sense of belonging at the 2018 CSUN Faculty Retreat. Photo by David J. Hawkins. 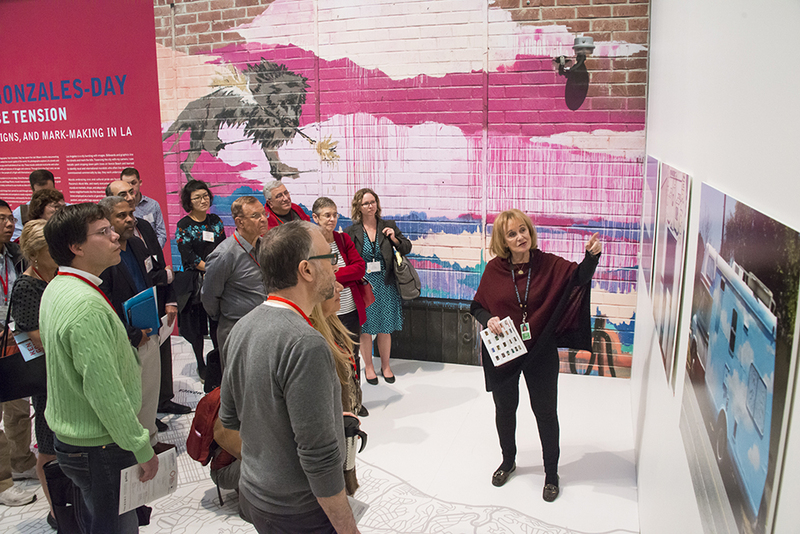 Attendees of the 2018 CSUN Faculty Retreat toured the Skirball Cultural Center. Photo by David J. Hawkins. CSUN Faculty Senate President Adam Swenson gives opening remarks at the 2018 Faculty Retreat. Photo by David J. Hawkins. Elizabeth Sussman, assistant professor in nutrition and 2018 Faculty Retreat co-chair, welcomes attendees to the event. Photo by David J. Hawkins. 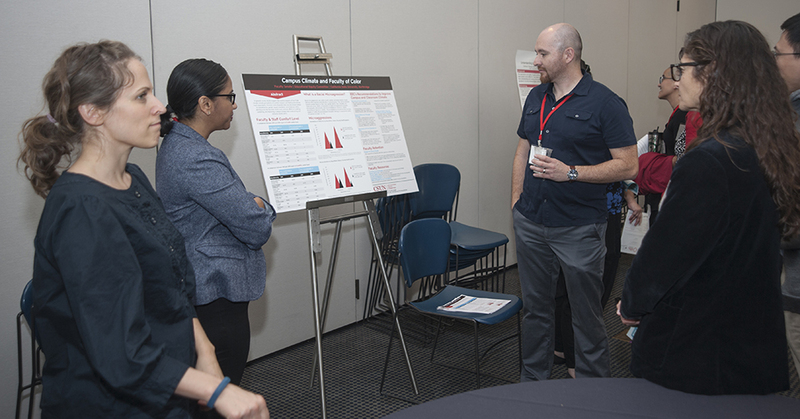 The 2018 CSUN Faculty Retreat included a poster session in the afternoon. Photo by Patricia Carrillo. The world of higher education is changing rapidly. These pressures on faculty — along with challenges presented by CSUN’s student success initiative called Matadors Rising — make it imperative for faculty members to feel a sense of community at the university, Harrison said. 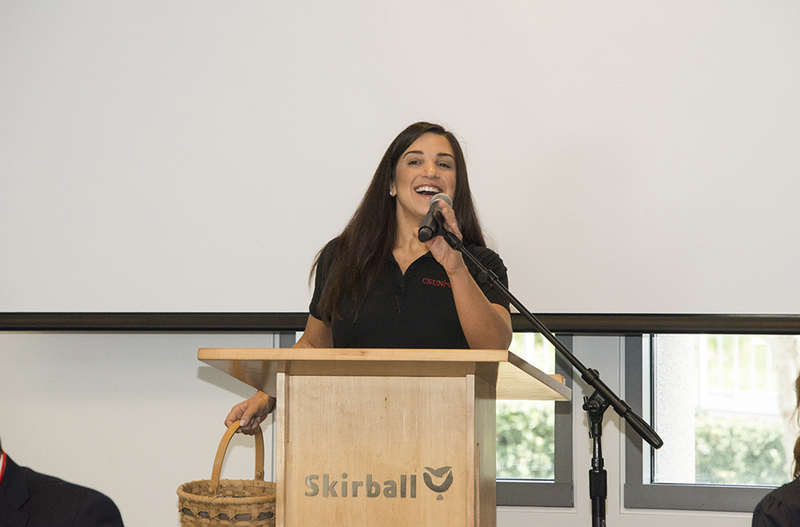 Harrison emphasized the importance of faculty success initiatives in a speech titled “Are Students the Only Ones Who Need to Feel They Belong?,” at the Jan. 16 retreat held at the Skirball Cultural Center. About 130 faculty attended the retreat, which was an opportunity for faculty members to relax and learn strategies for professional growth, which also will benefit students. 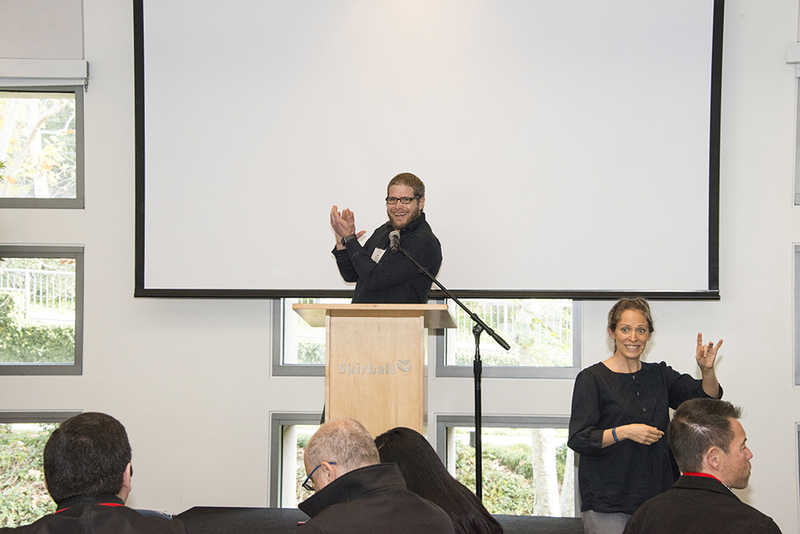 The event opened with a welcome from Faculty Senate President Adam Swenson and event co-chairs Kim Henige and Elizabeth Sussman. Vice Provost Stella Theodoulou discussed early gains, as well as challenges ahead, in the Matadors Rising student success initiative. 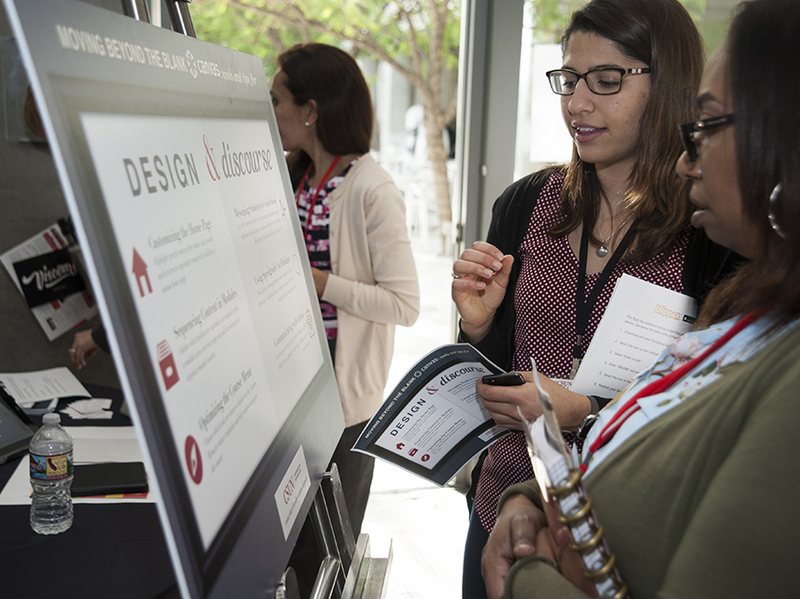 Matadors Rising is a localized approach to the California State University Graduation Initiative, aiming to increase graduation rates and reduce the time it takes to complete a degree. One of the goals of the Faculty Retreat, Swenson said, was to encourage faculty members to network within their departments as well as across disciplines. Networking will help faculty members benefit from the expertise of colleagues who have faced similar challenges and problems, and who can share tips about what works and what does not. CSUN’s student success initiatives, which have boosted graduation and retention rates since their launch in 2016, include emphasis on mentorship and campus activities to give students a sense of community. Similarly, faculty members are more likely to succeed if they feel part of a university community that understands and responds to their needs, Harrison said. A lack of sense of belonging can also create chronic stress and even mild depression, or result in a premature departure from the university, she said. “We are all human, and it’s inevitable that our everyday experiences and challenges on and off campus will have an impact on us, unintentionally affecting our relationships and, ultimately, the experience of our students,” Harrison said. CSUN has implemented programs to recruit, retain and mentor new faculty, such as a New Faculty Orientation Program, a Faculty Success Program that provides support for balancing workload and productivity, and a Solo Success Workshop that provides a faculty cohort for underrepresented groups to address their unique concerns. Harrison also endorsed lifelong mentoring programs to ensure the success of senior faculty. The Faculty Retreat itself helps foster a deeper sense of connection, Harrison said. For a transcript of President Harrison’s remarks, click here.